An addition to Google Maps this morning should have all New Yorkers who take public transit very excited. Google has had transit times for local subways and buses for a while now, but they also know that sometimes those vehicles don’t arrive exactly on-time. To help with this, they have added subway alerts and delays to Maps. 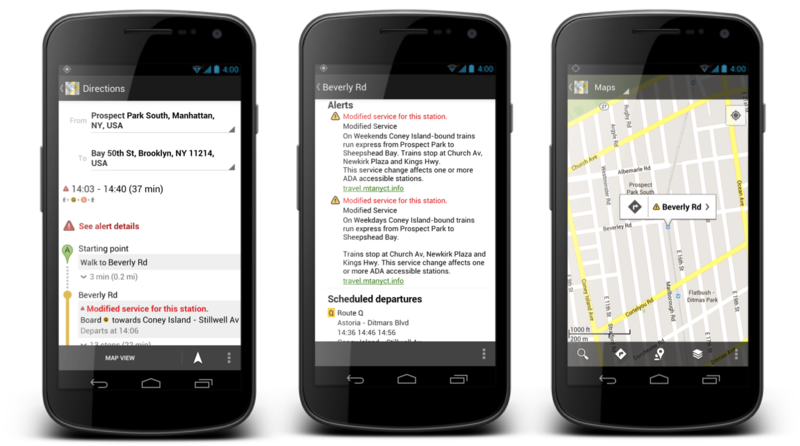 The Android app and web version of Maps will now alert you if any of NY’s subways are experiencing delays from maintenance or anything like that. If you are using navigation, Google will include these alerts and automatically re-routes to get you to where you are going. Maps may arguably be Google’s best app and it seems to only get better and better. What else do you want to see in Google Maps that they haven’t added already?